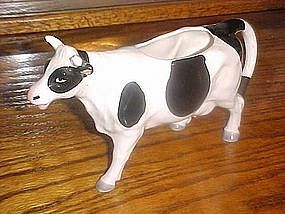 Nice cream pitcher that looks like a real holstien cow. Measures4 1/2" tall and is 7 3/4" long. Made of hand painted glazed ceramic. Marked K403, this may be made by Lefton. Wonderful condition but there is a flake off of the inside of one of the horns. A wonderful addition to your cow creamer collection.